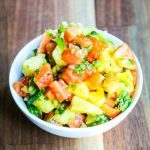 This week as part of Food Network’s Summer Fest, a group of talented bloggers are featuring farm fresh recipes using Melons that are in season. 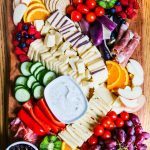 Each week, recipes using farm fresh produce will be featured on the Food Network website along with recipes by a group of fabulous food bloggers. 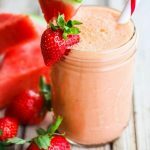 Although I love all melons, today, I am sharing a simple but super refreshing drink made with watermelon that my kids have been enjoying this summer. 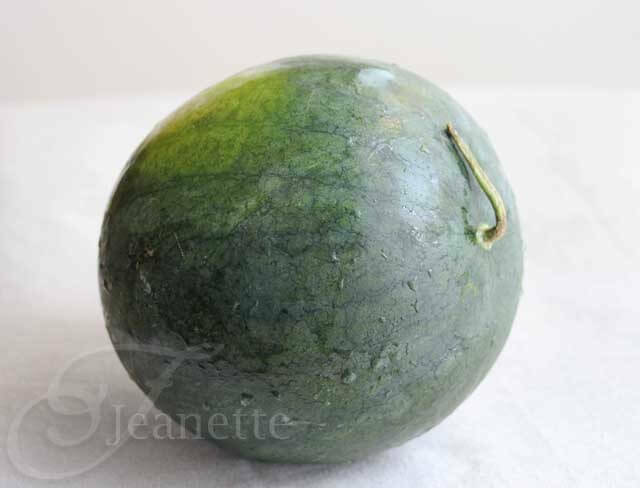 I buy watermelon throughout the summer, and was pleasantly surprised to find this Sugar Baby Watermelon in my CSA Box last week. This fresh watermelon was so crunchy and sweet, I can’t even properly describe it except to say it was way better than any watermelon you will find at the supermarket. 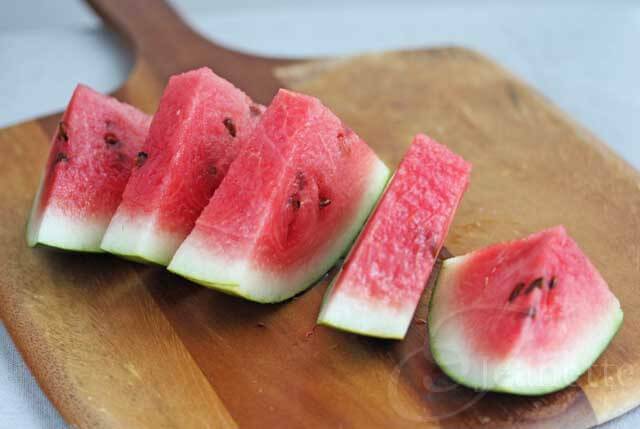 When I served this watermelon to my kids, their initial reaction was, “why are there so many seeds?” Nowadays, most supermarket watermelons are seedless. What happened to all those watermelon seed spitting contests? 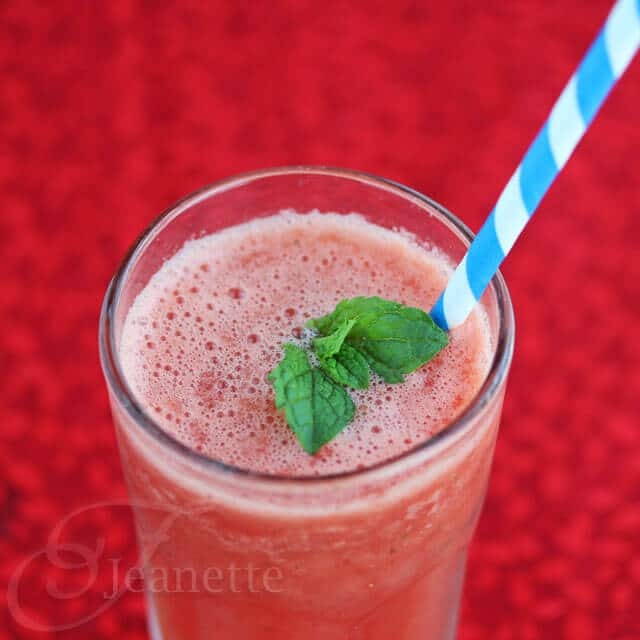 Although I usually serve watermelon wedges as a fruit after dinner, this Watermelon Mint Freeze has served as a frosty, refreshing, rehydrating drink for the boys all summer long, especially after a little competitive game of basketball in the hot summer sun. 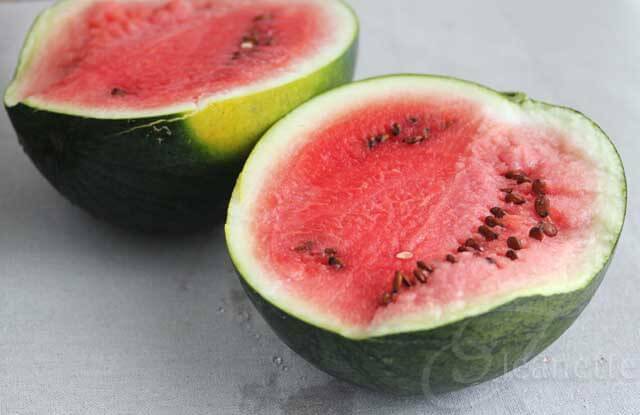 I used to think of watermelon as a fruit full of sugar and water, it’s actually packed with antioxidants, most notably vitamin C, vitamin A and a potent carotenoid called lycopene (also found in tomatoes and mangoes). 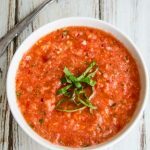 Lycopene has been found to be protective against prostate cancer, breast cancer, endometrial cancer, lung cancer and colorectal cancers. So, drink up. 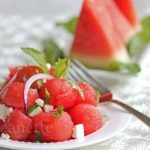 This Watermelon Freeze is ridiculously simple to make – just blend fresh watermelon chunks, fresh mint leaves, a little water and ice cubes until frosty. I’ve posted pictures of this on facebook at different times, and someone always asks how to make it, so I decided to post it here for anyone else looking for an easy, refreshing, frosty drink. 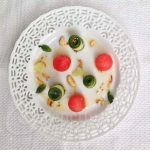 Alex, my youngest son, made a variation on this watermelon drink in his cooking video – Triple Fruity Freeze – check it out. 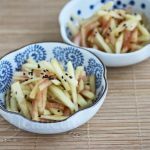 Be sure to check out the following recipes from all my friends participating in this week’s Summer Fest! Place all ingredients in a blender and blend until smooth and frosty. 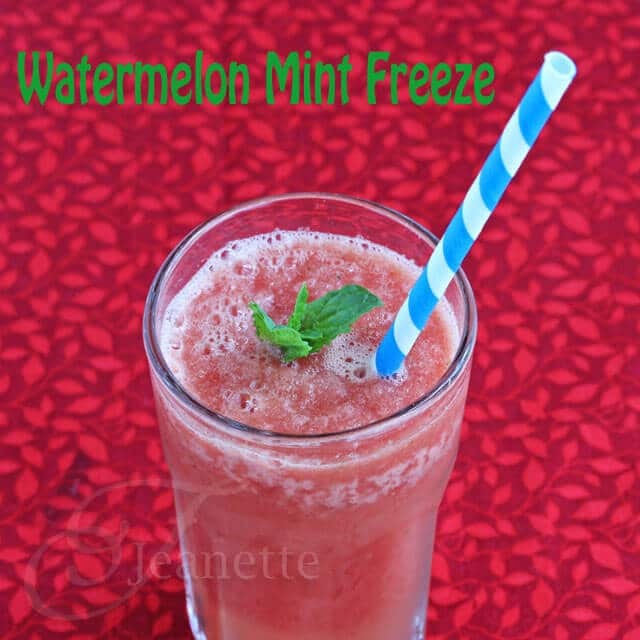 I love watermelon with mint and this freeze sounds perfect for the last of summer days. Sugar baby’s are amazing – i always have my eye out for them! 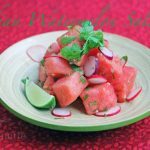 Watermelon is a favorite of mine and this sounds perfect for these hot Texas days. I’ve never tried the Sugar Baby variety. I need watermelon in my life. Like, right now! 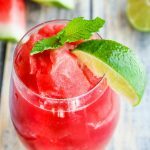 I swear I JUST saw watermelon mint popsicles on another blog and was bemoaning the fact htat I don’t own popsicle molds when here you are with this fabulous smoothie! Love it. Simplicity at its best. Gorgeous color too. I am going to miss watermelon too when summer comes to an end. 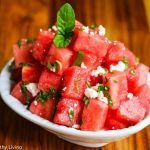 Meanwhile, I’ve got a whole watermelon sitting on my counter that I plan on making more freezes with for my kids so they can savor the last few bites of summer.